Few players or listeners will be unfamiliar with the tunes “The Hills of Moffat” and “John D. Burgess”. 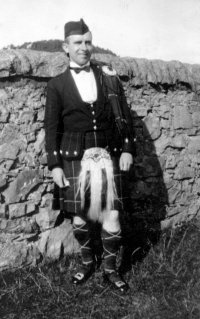 I recall the late Alex McArthur introducing the latter tune by saying that because of its style many people incorrectly attributed it to Bobby McLeod, a tribute in itself, but that it was actually written by a piper from Moffat – George Cockburn. Where better to start then than by speaking initially to local music and dance enthusiasts Tom and Margaret Porteous, themselves residents of Moffat, who were able to direct me to George’s daughter, Margaret Rae, who still lives in nearby Lockerbie. Over a cup of tea Mrs Rae told me about her father. George S. Cockburn was born in Craigmillar in Edinburgh in 1897. He was tutored in piping by his father and on leaving school began work at Murray’s Brewery in Craigmillar. At the outbreak of war in 1914, although only 17, he volunteered and was enlisted into the 9th Battalion Royal Scots – “The Dandy 9th” as they were known. Having served throughout the war in France and Belgium he returned to Murray’s after hostilities ceased where he ultimately became Transport Manager. George became a member of the Highland Piping Society in Edinburgh and over the years won all the Society’s trophies. He was a gifted pibroch player and second to none at playing for Highland dancing. He attended the various Highland Gatherings, Oban being his favourite, and won numerous medals in the competitions. During the Second World War he was Pipe Major of the Edinburgh Home Guard Pipe Band. Always a great family man he taught his two sons and his grandson to pipe but refused point-blank to teach Margaret since he considered it ‘unladylike’. George composed a great many tunes over the years but, sadly for us all, most were handed to fellow pipers (for whom the house at Murray’s Brewery was a musical haven) without titles and have probably since been either lost or credited to other composers. One exception was a six eight march which was played at every opportunity by a young piper at the Society who was studying at the Castle under the renowned Pipe Major Willie Ross – John D. Burgess. During George’s working life one of his greatest pleasures was to motor down from Edinburgh to Moffat in the family’s tiny saloon car. He would halt the car at the top of the Devil’s Beeftub and gaze down at the town, which lies encircled by the beautiful Lowther Hills saying that one day he would stay in Moffat. he chance presented itself for George to do just that when eldest son Iain, a Maths teacher, was offered a post at Moffat Academy. Margaret and husband Neil, had already moved to nearly Kettleholm and when George’s health began to give cause for concern he took the opportunity to retire early and fulfil his dream by settling in Moffat. 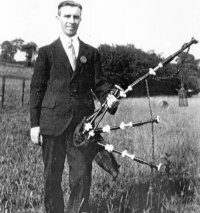 Although his health forced him to decline an invitation to become involved with the local pipe band in Moffat, he was inspired to compose a tune for them which he entitled “The Hills of Moffat”. Another direct link with our own music world was provided by Iain. He was very interested in traditional fiddle music and on a visit to Aberdeen he met Hector McAndrew. A close friendship was formed and frequent visits to each others homes ensued. Hector accompanied Iain to fiddle nights with Willie Scott at Eskdalemuir (late Bentpath) and to Kenny Wilson’s home at Elvanfoot. Hector said that given time Iain would have been one of Scotland’s finest exponents of the instrument. Sadly however, fate decreed otherwise and Iain died from cancer at the age of only thirty-four, a loss from which his parents never fully recovered. George Cockburn died in 1974 leaving us with at least two very fine tunes for which he will long be remembered. I have been intrigued by your website, found by my son, Iain, in Boston, Massachusetts. You may be interested to know that I have my father's set of pipes still with me, adorned as they are with hallmarked Edinburgh silver, every time he won a trophy, from the 20s on. He was a musician, and conjured the most wonderful sounds from what is, I have to say, a somewhat uncouth instrument. I last played his ancient and mellow-sounding set at the funeral of a friend in Kirkcudbright, six years ago. Alas, arthritis now prohibits me. Not that I have ever matched his artistry. The great 6/8 tune John Burgess was originally called Colonel William Frizell. I think he was in charge of the Home Guard in Edinburgh. But when John played it one night in our house, my Dad said, "That is your tune." I did, however, once win a prize (in competition with John Burgess, at The Highland Pipers Society in Edinburgh) of a set of pipes donated by John Shaw – who, famously, died of a heart attack, while piping the corpse of Compton Mackenzie from the beach at Barra to the kirkyard! I have them still. The competition tune was Mrs. McDonald of Dunach. I have a stash of manuscripts of my Dad's. Most of them – at least the best – are either his, or versions of somebody else’s, and are now commonly played as part of the corpus of folk music. But I know not whether he, or somebody else, originally composed them. Bit like Robbie Burns, I suppose, he remanufactured whatever he could find, including themes from his limited collection of Beethoven and Mozart. John Burgess – whose soccer boots I wore for some years – was, probably, the most gifted piper of his generation, matched possibly by my brother Iain, unfairly brought down by TB and cancer. He (Iain) was good and gifted, as Hector Mc Andrew said. Last saw him (McAndrew) at the Mayberry Roadhouse in Corstorphine, Edinburgh – now sadly a casino. Delighted to receive your E-mail re your late father. By coincidence I was playing with the guest band at Karin, our Editor's, Club at Newmill-on-Teviot (near Hawick) on Wednesday night and one of the points I raised was the fact that although we know something of the prolific composers, in many cases we know nothing at all about the people with one or two very good compositions to their credit. One of the obvious ones in the dance music scene is the Bluebell Polka by F. Stanley (not Jimmy Shand as most people think). I doubt that there's anyone alive who now knows who F. Stanley was which I find really sad. Unfortunately no one in the National Association of Accordion and Fiddle Clubs has really had the time to knuckle down and do things like research tune titles and composers. When the magazine started in 1977 a lot of these guys would still be around, (or at the very least people of the next generation who knew them or knew who they were) but in the intervening years they have all gone. Again on the dance music scene Lindsay Ross, Andrew Rankine, Bobby MacLeod, Angus Fitchet and now Sir Jimmy Shand have departed the scene, all in the last few years. Anyway, I say this because it was that thought which prompted me a few years ago to try and find out something about you dad. When Karin set up the Web-site last year it was the first article I re-typed because it was fairly short and I could finish it in an evening and because he was reasonably local (I stay near Biggar). Historically this part of the world isn't known for outstanding musicianship in any field so it was nice to find at least one exception. What I haven't got round to doing was re-establishing where your sister stays to borrow and scan the only photo she had (certainly from your dad's earlier days) when he was in the Dandy 9th. She did mention at the time that you probably had inherited more interesting photos than she had? Photos bring articles on the web to life. Do you have any we could borrow, scan and return? If so could you please send them to Karin Ingram, Filters House, Dodburn by Hawick TD9 0PG Tele 01450-850 262. It's interesting that you still have manuscripts. I know what you're saying about the origins of these being rather lost in the mists of time. Rory MacLeod at the Piping Centre in Glasgow edits their magazine “Notes” which comes out quarterly. They gather some interesting bits and pieces. Their E-mail address is daybreak@btinternet.com - it might be an interesting and informative exercise to photocopy what you have and let them see it. They have the expertise to recognise known tunes from unknown ones – who knows what may come to light. Their address is The National Piping Centre, 30-34 McPhater Street, Cowcaddens, Glasgow, G4 0HW. You mention The Bluebell Polka, by F. Stanley, of whom I know not, but I do remember dancing to it in my youth, including to Jimmy Shand, in the BBC studios (in Queen Street?) in Edinburgh in the early 50s, when they used to do a weekly live SCD programme, with an audience to applaud and live dancers to add atmosphere. Have found a manuscript of The Liberton Polka. To whom is this attributed? Or was it always there? A good tune anyways. When I have played it, admittedly to those who would not be expected to know, nobody knew anything about it. I have also just dug up, from the archives, a letter from the front, in 1917, where my Dad asks of his Mother if his Dad likes his latest tune. This "latest" tune was, I suspect, Colonel Green, a lively 6/8, played by Hector McAndrew and others, especially around Moffat. I have a manuscript of it somewhere. Will search. Here are some for you to select from, crop, do what you will with. The small oval is on his enlistment in 1915, aged seventeen. He was demobbed in February 1919 having, according to his discharge certificate, led a blameless and undistinguished life as a piper in the Dandy Ninth. He would also, of course, have been a stretcher-bearer, because that is what bandsmen did – presumably after lunatically standing on the parapet. But he would never talk about the war. 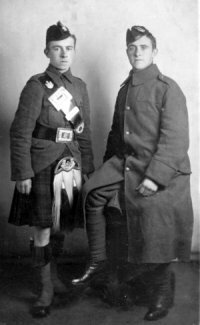 The one of two soldiers (he in the kilt) is of him and his brother John (who was a regular) on his one leave in early 1918. The solo of him in fancy dress is, I think, at The Inverness Highland Games in 1923 or 4. 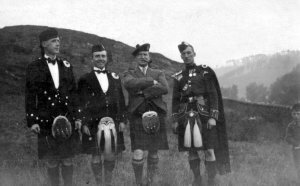 The photo of four men is at The Oban Highland Games in 1922; the photo was said by my aunt to be of the three medal winners and the judge in the “Ceol Mhor”. The judge looks suspiciously like Willie Ross of Edinburgh Castle. The piper on the right is, I think, John Wilson of Edinburgh, who was a professional piper (Police and Army) whom my dad thought to be one of the best around – until he lost the tips of his fingers in some accident. He then emigrated to Canada. But I remember hearing him play beautifully in our house in ’47 or ’48, when he made his one visit back. The one I like best – never could really understand this passion of Lowlanders to wear Celtic tribal dress – is him in his suit, wi’ his pipes in his hands.